Do you have a penchant for vintage-style frames decorated with rhinestones?? 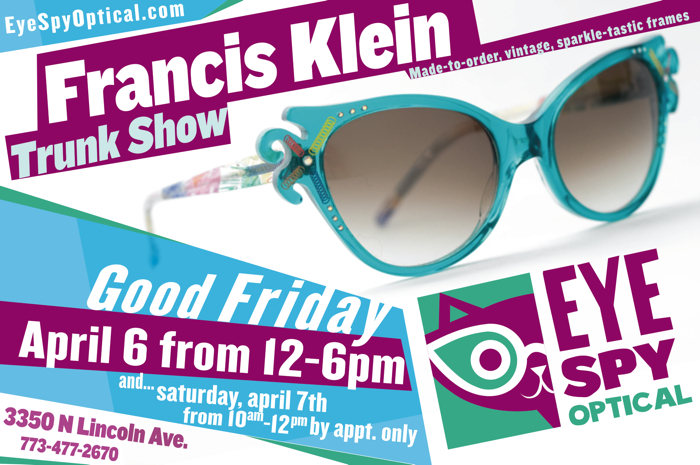 If so, head on over to Eye Spy on Good Friday from 12-6 PM and make it a Great Friday! We will be donating 1% of our sales to the Greater Chicago Food Depository. Can’t make into Eye Spy on Good Friday because you are too busy making matzoh balls and charoset? We also are showing the collection by appointment on Saturday morning the 7th from 10 AM-12 PM. Call us to make an appointment at 773.477.2670.